We started our trip on the corner of Netting Fence Track and Perenna Road which is north of Nhill it is a fair drive from Melbourne but when there\'s 4x4ing to be done no distance is too great. We turn onto Pella Track and head north, the road is a dirt road which can be great fun when it is extremly wet and muddy. Further north we take the left turn onto Chinamans Flat Track which takes us into Wyperfeld National Park, you should check with local ranger to check track closeures. The next turn is at Nhill Murrayvale Road take this north until you turn back into the park at Milmed Track. Take this road all the way through until you reach Pella Track again then you can head south to Nhill. This is an enjoyable track with many campsites and terrific scenery. 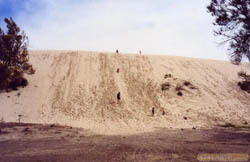 I dug up this old picture of a sand dune from our holiday, I wanted to bring the hill home to have fun on.